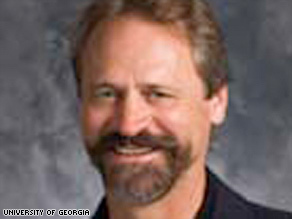 Police are looking for a University of Georgia professor in the shooting deaths of three people on Saturday, authorities tell CNN. Sonny Wilson, Athens-Clarke County coroner, confirmed three people were dead, but couldn’t provide identities. UGA is in Athens, but university spokesman Pete Konenkamp said the shootings did not happen on campus. Information about the shooting was disseminated through a campus-wide alert, which identified professor George Zinkhan as a shooting suspect. “George Zinkhan is a white male in his mid-50s with a goatee or beard. … He was last seen wearing a polo shirt, blue shorts, and a backpack. He was last thought to be in a red car in the area of Prince Avenue,” the alert said. CNN affiliate WSB-TV said the people were shot behind The Taylor-Grady House, a National Historic Landmark on Prince Avenue. Zinkhan teaches in the department of marketing and distribution at the Terry College of Business, according to the UGA Web site. The incident is being investigated by Athens-Clarke County police, with campus police assisting.